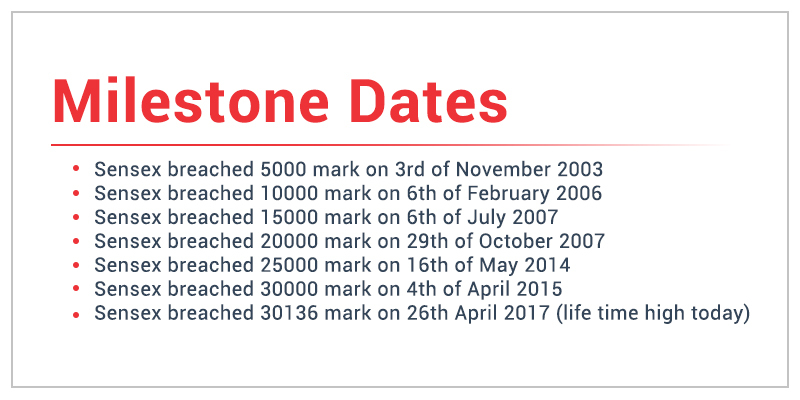 26 April 2017 - another date to be marked in the history of the stock market, as the BSE Sensex reclaims 30,000 mark, while Nifty50 hits a lifetime high of 9360. This significant rally in Sensex in the year 2017 has happened because while India’s share of global GDP at 2.99%, its global market cap was just 2.26% at the beginning of 2017. This 0.73% gap is a wide one indeed and has been the highest since 2003, when the Indian markets were down in the dumps. This rally is more important to us as it has taken place without any input of Foreign Institutional Investment and as more and more market drivers are shifting their gears from FIIs to domestic mutual funds. In fact, FIIs have cut their positions in index features by about 50% in April, amidst the concerns that upsides could be limited to stock market at high record levels. This upheaval shift in paradigm related to Foreign Institutional Investment was initiated as on March 23 2017 when FII held over 2.23 Lakh net long contracts in the index futures segment, which has been the highest this year. Unwinding this picture, the FII net long position in the index futures segment fell to 1.06 lakh contracts on April 21. Then the same position rose marginally to 1.14 lakh contracts on April 24. Finally, on April 25, the history happened, as FIIs net sold index futures of worth Rs 805 crore. But despite all these, the BSE Sensex managed to achieve its milestone and reclaimed 30,000 mark. This indicates a diminishing role of FIIs in deciding market levels. It is also worth noting here that equity markets in India have traditionally peaked when net long position of FIIIs is between 2.5 to 3 lakh index futures contract. Even in the cash market FIIs stood as the net sellers of stocks worth Rs 930 crore for the month of April so far. Also, since March 23 when FIIs started unwinding their future positions and bought only in cash market, they were the net buyers of stocks worth Rs 2,825 crore as compared to the net buying of stocks worth Rs 9,778 crore by domestic mutual funds during the same period. Ignoring all these pessimistic approaches by FIIs, both Sensex and Nifty managed to gain by 1.5% over the past one month. Going forward the domestic mutual funds with assets under management of Rs. 6 lakh crores and cash in hand of more than Rs 40,000 crores are expected to manage the show. The total market value of domestic money invested in the BSE-200 at the end of March 2017 was bigger than the value of foreign fund holdings for the first time in two years. It is estimated that the value of Indian non-promoter and non-government holdings was $323 billion as compared to $303 billion held by foreign funds. Since October 2010, the cumulative 24-month flow of domestic funds has also been greater than the FPI flow for the first time. While the domestic funds invested $16 billion in local stocks in last two years, the FIIs invested $6 billion. Hence, we can well understand the fact that Domestic Institutional Investors (DIIs) are holding more stable position than the Foreign Institutional Investors, and this is most likely to grow with each passing day owing to increasing SIP (systematic investment plan) investments and rising flows into National Pension Scheme and the Employee Provident Fund Organisation (EPFO). This rising share of local funds is of utmost important as it reduces market volatility and fluctuation every time FIIs pull out money as part of global risk aversion strategy. This has been a major reason for the Indian equity market to hold on its own since December 2016 quarter despite FIIs having sold $4.5 billion worth of equities. SIPs by retail investors have also played a big role in this significant growth with monthly flows increasing to Rs 4,200 crore from about Rs 3,500 crore last year. According to the Association of Mutual funds of India (AMFI), mutual funds are on an average adding 6.3 lakh SIP accounts every month with an average SIP size of Rs 3,200 per account. In the last few months, the SIP accounts have raised by nearly 40% of the total monthly equity mutual fund collection, which is likely to further increase by 45%. Fundamentally, we maintain our view on Sensex as enumerated in our note dated 3rd January 2017. Our estimated target for Sensex for calendar year 2017 remains 30247, with upside boundary at 31800. Our EPS estimated for Sensex for FY18 remains 1509 (12% y-o-y- growth v/s consensus estimate of 16%). Commentary by the management of the companies that have declared their Q4FY17 numbers by now have largely shown confidence for FY18. But we still are not sure of earning trajectory post GST i.e. quarterly bumps, though we remain highly optimistic as far as long term earning outlook is concerned. Remember, quarterly volatility in earning outlook will proportionately create volatility in stock prices. For short term, we advise patience till complete earning clarity emerges. Best strategy to invest at current levels would be through systematic investment plan, which otherwise too is the most optimal strategy for investors.